Google are withdrawing support for SMS alerts under the free version of their popular Calendar service on June 27th 2015. 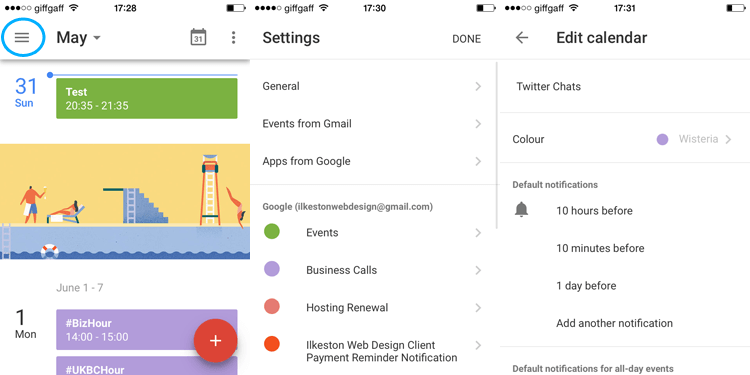 Unless you’re a paid customer of Google Apps, you’ll have to use a smartphone to set up alerts using the Google Calendar app or the built in iOS calendar in place of SMS alerts via your phone network carrier. A couple of weeks ago I wrote about how I’ve been using the SMS alerts to remind myself about Twitter tweetchats. In principle, nothing has changed. I only need to spend a little time understanding and configuring the calendar options on my mobile device and get them synced with Google’s own calendar. Anyone who hasn’t got a smartphone will be feeling left out at this stage unless they value the Google SMS service enough to consider paying for it. It’s a shame because I like receiving the texts via my phone network carrier, mainly because the messages could be forwarded to a phone contact. Currently I have an iPhone and iPad so I’ll be able to receive notifications in lieu of texts. I cannot speak for Android or other smartphone operating systems. It’s the preference of many busy business owners/managers to get SMS directly to their handset because not everyone has a smartphone compatible with Google calendar. What if you have employees who get the notifications on their mobile phone. What are you to do, buy them all a smartphone? One of the reasons I chose SMS for important reminders and alerts is that I pay more attention to a text message then to the daily influx of notifications from social media and email. Every single day I receive email and a proportion of it is disposable, unsolicited or low priority. Each time something “new” is received the phone makes a noise. For this reason I try to unsubscribe from junk but it’s inevitable to keep getting sucked into each and every notification alert on your device. The SMS was perfect because I already knew to anticipate the messages because I’d set them up in advance. You said it Dave! I’m in complete agreement. I’m also kicking myself for being seduced by Google tech that never sticks around for the long term. 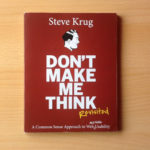 It seems I’ve no choice but to begin making the transition, and the sooner the better. First, I’ll try the baked in iOS calendar for my Apple devices. I’ve already synced my iPad/iPhone with my Google account to receive mail, meaning the calendar data has already been pulled in. It just needs tweaking to get notifications in the best possible way. 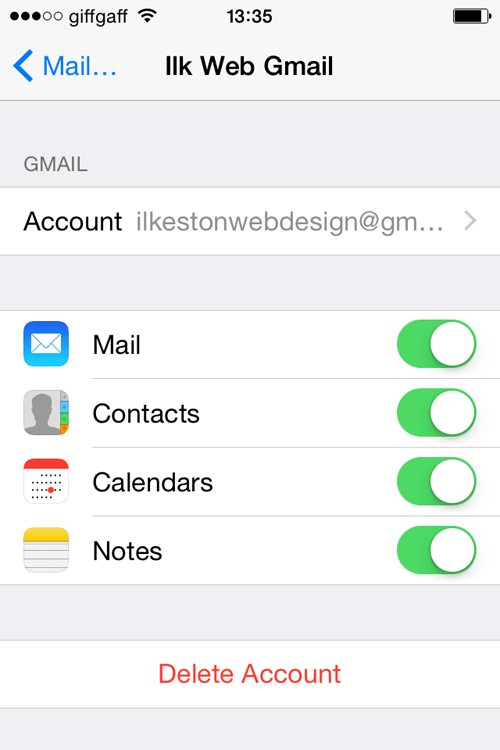 If you haven’t already done it, add the Gmail account associated with the calendar account via your iOS Settings area and choose to import the Google Calendar. In the screenshot from my iPhone you can see I have Calendars as well as Mail, Contacts and Notes enabled. Adding a Google account to an iOS device is easier than you think – there are no SMTP server settings needed – just your login credentials. 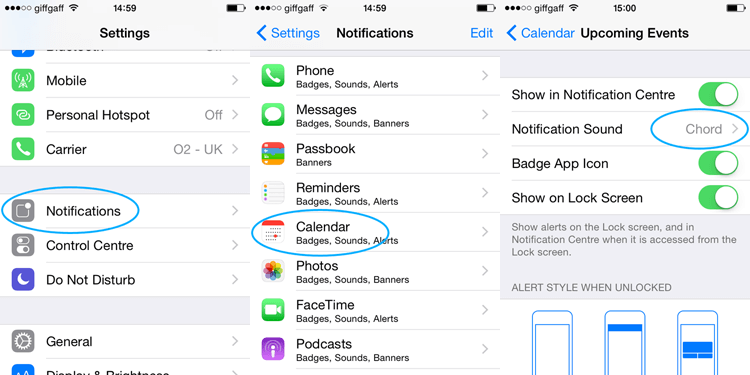 Once your iOS calendar is configured you’ll get buzzed every time an event is triggered in the Google calendar. 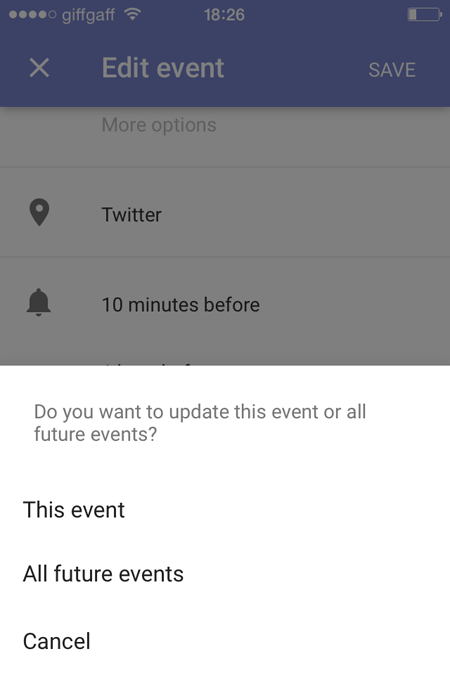 These events can still be created and edited within the Google calendar web app but the SMS feature will obviously soon cease to exist. Add a “Pop up” notification in the Google calendar web app and it will put a Notification Alert on your iOS calendar under that event. Of course, you might just want to set up the calendar events on your iOS device in the first place because it’ll sync with the web app calendar. 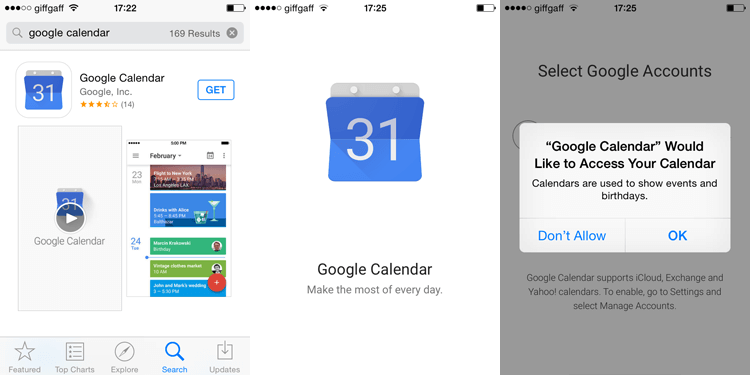 The iOS calendar is okay but you might be interested in Google’s own app instead. I just wonder if they’re going to take that away in the future too? 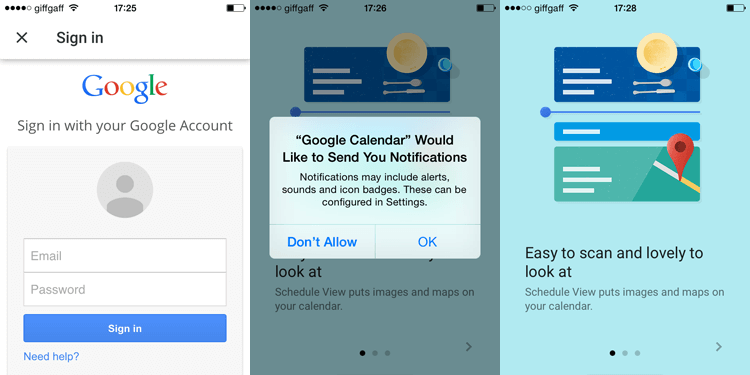 The Google Calendar app can be installed onto iOS and Android. When your calendar events are triggered they will buzz you. 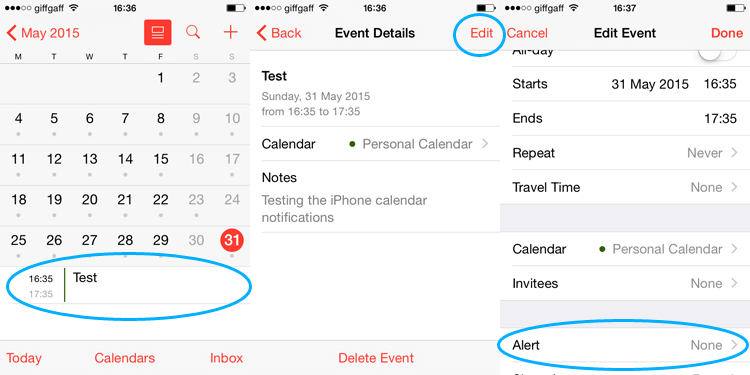 The settings are a bit better than the native iOS Calendar and visually everything is easier to process. I’ve heard it’s probably best to disable Google Calendar from the native iOS app if you’re installing the official Google Calendar app. It could cause conflicts and mean you don’t get your notifications. 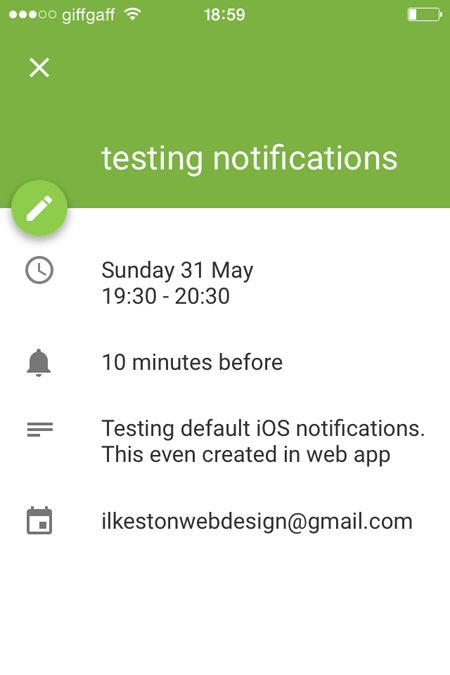 Also, be sure to make sure your Google Calendar app notification settings are turned on by referring to these instructions. In the screenshot below you can see I’ve tapped the menu icon in the top left of the app, accessed Settings and then selected a particular calendar I want to configure. If you’ve been using the SMS alerts, you’ll need to individually edit those events and change them over to phone notifications. 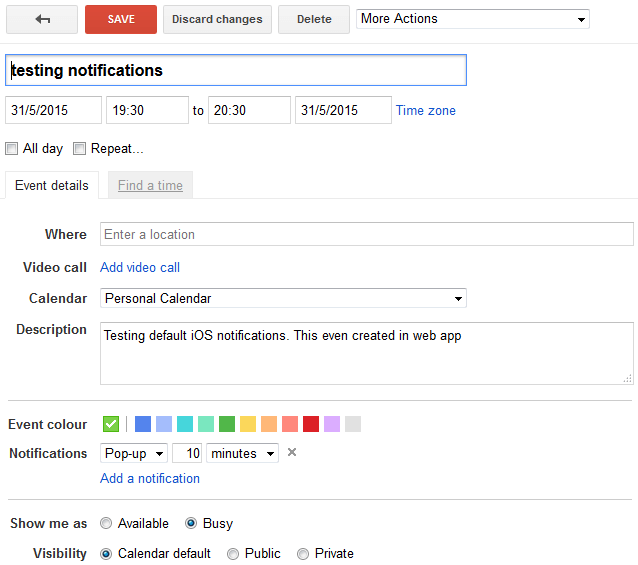 I recommend logging into the Google Calendar web app and manually removing events using SMS. I wonder if existing SMS notifications will be automatically changed to “Pop up” notifications on June 27th? That would be useful because it would mean all the events on my iOS mobile device will be changed to standard notifications. 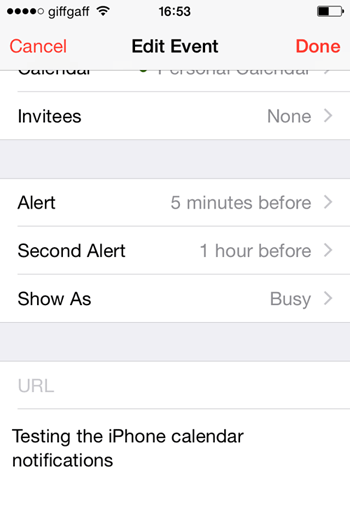 Anyway, new events created inside the iOS app inherit whatever default notification settings you’ve given the calendar to which that event belongs. Fine, it works. But I want to know how my iPhone or iPad handles events created in the Google Calendar web app on my PC. The alert came through, which means I now know that notifications set up as Pop up (I always thought these were for if you’re signed into Google on a PC) actually work on the iOS device too. I’m more the wiser now. The good news is, you can then selectively edit individual events on the same calendar, even if you’ve set up default notifications settings. This overrides notifications for the events you choose. Users of Google Apps can pay about £33 annually plus VAT to maintain their SMS system if it’s that important to them. In defence of the big G, they don’t owe you anything, and you should know by now that they’ll retire products/services on a whim (I’m still mourning iGoogle). Calendar apps are out of the question for anyone using phones like BlackBerry, because they don’t support the calendar app. If you have advice , please comment at the end of the post and share any ideas.